The sub-4 metre cross-hatch segment has been dormant for a while in terms of sales figures. So why would any manufacturer want to introduce a new one? Well, apart from setting a new benchmark, we can’t think of anything else, really. And that’s exactly what Ford is aiming for with its latest offering, the Freestyle. Although it is based on the ageing Figo, the Freestyle has a lot going for it apart from its faux-SUV looks. 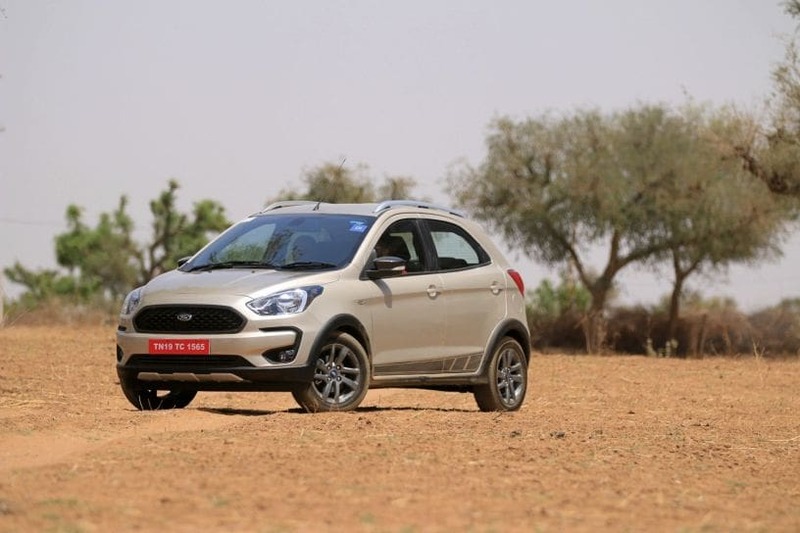 We drove Ford’s latest baby in Rajasthan to find out if Ford has managed to shake up the cross-hatch space. Trivia: Ford has named the cross-hatch version of the Figo as the Freestyle in India. However, it is known as the KA Freestyle in Brazil and the KA+ Active in Europe. The Euro-spec KA+ and the KA+ Active are exported from Ford’s Sanand plant in Gujarat. The Ford Freestyle is available in four variants – Ambiente (base), Trend, Titanium and Titanium+ (top-spec). Dual-front airbags and ABS (anti-lock braking system) with EBD (electronic brakeforce distribution) are standard across the range. What sets it apart from the Figo? There's no denying that the Freestyle is basically a Figo dressed up like an SUV. However, there are some noticeable changes as the Freestyle previews the design of upcoming Figo facelift. Apart from customary cross-hatch add-ons such as faux skid plates and body cladding, the Freestyle retains the silhouette of the regular hatchback. The Freestyle adorns Ford’s latest grille design that is set to make its way to the upcoming Figo and Aspire facelift as well. The grille is sleeker than before and the new mesh pattern looks sporty with a dark grey finish on the Freestyle. The headlamps have been carried over, albeit with subtle changes such as finer chrome detailing. Overall, the front profile looks striking and sharper than the Figo. Expect to see similar changes in the updated Figo and Aspire as well. View it from the side, and you’ll notice that the Freestyle looks chunkier than the Figo. The hefty body cladding, roof rails and the pronounced bumpers do a good job of adding a sense of ruggedness. And this explains its increased footprint when compared to the Figo. In fact, at 3954mm, it is just 45mm shorter than the EcoSport. That said, the wheelbase remains the same as the regular hatchback, so don’t expect any additional space on the inside than what the Figo already offers. Compared to the Figo, which sports 14-inch wheels and 175/60 tyres, the Freestyle gets larger 15-inch units with 185/60 cross-section tyres. However, the tyres are marginally narrower than the 195/55 R15 units seen on the Figo Sports. The twin-four spoke wheels get a dark gunmetal finish and looks good even without the machine-cut finish seen on other cars in the segment. The changes at the rear are limited to the bumper, which mimics the front, and the subtly altered graphics for the tail lamps. At 190mm, it rides 16mm higher than the Figo. The raised ground clearance and wider wheels add a bit of character and the Freestyle looks a lot bolder than the regular hatchback. The Freestyle shares its cabin with the Figo hatchback. However, it gets some much-needed enhancements that certainly lifts the mood inside. The cluttered and button-heavy centre console has been replaced with a sleek, floating 6.5-inch touchscreen. The dashboard of the Titanium+ variant gets a chocolate-and-black finish. The darker theme lends the cabin a sporty feel, but some could find it a bit claustrophobic. Personally, I love the black headliner on this variant. The brown-and-black fabric seat upholstery complements the dashboard well. The all-weather rubber mats add a sense of ruggedness too. Interestingly, you see the new mat in the boot as well. So, there are no cost-cutting measures here. On the flipside, the issues that are there in the Figo continue to bother the Freestyle as well. There’s room for improvement when it comes to the fit and finish, and Ford could have used this opportunity to fix the drab looking instrument cluster, the non-adjustable rear headrests and the absence storage spaces on the rear doors. There’s also no reach adjustment for the steering wheel and we would have liked an armrest for the driver as well. Both of these features are there on the Euro-spec model, which is produced right here in India. The Freestyle’s cabin space remains identical to the Figo, which means space for the rear passengers is a little tight. And at 257 litres, the boot space is identical to the regular hatchback as well. Is it loaded with tech? The Figo features Ford’s latest SYNC 3 infotainment system with a 6.5-inch screen, which is one of the two options available with the EcoSport as well. It gets both Google Android Auto and Apple CarPlay and is amongst the best infotainment systems in the market. However, the SYNC 3 system is only available with the range-topping Titanium+ variant. But there’s no need to worry as Ford offers a touchscreen infotainment system with built-in navigation in all variants except the base. The Titanium and Titanium+ variants get ESP (electronic stability programme), traction control and hill hold assist. Ford likes to call the combination of these safety systems as anti-rollover protection or ARP. This system is capable of applying the brakes on individual wheels and decrease engine torque if it detects a possible rollover. In the case of the Figo and the Aspire, these features are available only on the petrol automatic version. In the case of the Figo and the Aspire, these features are available only on the petrol automatic version. These active safety features are beneficial in everyday driving, especially the hill hold assist, which retains the hydraulic brake pressure for a few seconds after you release the pedal to ensure the vehicle doesn’t roll back while starting from an incline. It’s great to see Ford stepping up its game when it comes to safety. In fact, it is the only mass-market manufacturer in India that offers six airbags across its entire product portfolio. Exclusive to the Freestyle are automatic headlamps and rain-sensing wipers along with auto-dimming inside rearview mirror, updated MID, front adjustable seatbelts and push-button engine start-stop. The rest of equipment such as emergency assistance, programmable key and auto climate control have been carried over from the Figo/Aspire. The Freestyle debuts the second motor from Ford’s ‘Dragon’ family of petrol engines. The 1.2-litre, 3-cylinder motor shares its engine block with the 1.5-litre, 3-cylinder petrol unit that powers the EcoSport facelift. The lower displacement is courtesy of the reduced bore and stroke. This engine is paired to a new 5-speed manual gearbox sourced from Getrag. The Freestyle is also available with a diesel engine, the same 1.5-litre TDCI engine (100PS/215Nm) that also powers the Figo, Aspire and the EcoSport. However, there’s one big change as the diesel version too gets the new 5-speed manual. Currently, the Freestyle is the only car in Ford’s lineup in India to feature the new manual gearbox. How does the new petrol engine perform? From the get-go, the new 3-cylinder motor feels far superior to the older 4-cylinder unit. Good job Ford! The latter was a little sluggish and unable to put down the power to the road as it claimed on paper. The new one is excellent at both – it has class-leading figures and feels punchy as well. Since it’s got an odd number of cylinders, it is quite natural to expect some vibrations. Thankfully, it doesn’t have any, regardless of it missing a balancer shaft that keeps vibrations in check. That said, it could produce vibrations under a cold start, but it gets fairly smooth in no time. We can’t stop praising the new petrol engine in the EcoSport and the second engine from the ‘Dragon’ family continues to impress. At city speeds, the new 1.2-litre petrol motor doesn’t require frequent gear changes. It pulls cleanly in higher gears at low speed without any hiccups. During our test drive, we were able to negotiate speed breakers at just under 20kmph, which is a usual scenario in day-to-day driving, even in third gear quite effortlessly. Out on the highway, the Freestyle is capable of hitting triple-digit speeds rapidly. The engine even lets you pull from 40kmph to triple-digit speeds in fifth gear! In this case, however, the progress is quite lethargic. If you need to put a smile on your face you have to work a little bit more. Being a small displacement, naturally aspirated engine, it has to be revved to extract the most out of it. Keep it in its sweet spot and the new engine won’t disappoint. However, the new engine pulls no surprises, and the power is delivered consistently and in a more tractable manner till it maxes out just below the redline at 7000rpm. Speaking of which, the engine is rev happy and the new slick-shifting 5-speed manual from Getrag enriches the whole experience. It slots in much better than the older one and the super light clutch makes for smooth shifts too. What will impress you the most is its ride quality. Be it within city limits or at triple-digit speeds, the Freestyle never ceases to impress. The revised damping helps the Freestyle absorb undulations better and it hardly filters anything into the cabin. The impressive ride quality can certainly match that of cars from a segment above. As it sits 16mm higher than the Figo, Ford has had to stiffen up the suspension setup and the anti-roll bar to ensure it doesn’t sway from side to side due to the relatively higher centre of gravity. The 30mm wider track (the distance between the two wheels mounted on the same axle) at the front and rear help improve stability and offers better cornering as well. The wider track also gives the Freestyle a better stance as the wheels jut out from its wells ever so slightly. All of the above changes make for a more mature ride and you’ll certainly appreciate the new setup over the current Figo. The electronically assisted steering also plays an important part as it is feather light for city manoeuvres and weighs up well as speeds increase. Oh, we almost forgot to mention the new petrol engine has a raspy note that urges you to push it even harder. The new gearbox and engine combo make the overall experience so much better compared to the old setup that you’ll start thinking that it is time for Ford to slap on ‘The Josh Machine’ sticker that came on the windscreen of the Ikon on the Freestyle as well! The Ford Freestyle's prices start at Rs 5.09 lakh for the base petrol and Rs 6.09 lakh for the base diesel (introductory prices, ex-showroom, Pan-India). At this point in time, the Freestyle is around 40K cheaper than the base petrol and diesel variants of the Figo. This makes it quite hard to resist not only over the Figo, but also its rivals such as the Maruti Suzuki Ignis and the Toyota Etios Cross, especially when you consider its impressive ride quality. Other factors that help its case are the raised ground clearance, the punchy new petrol engine, the slick-shifting gearbox and the amount of safety tech that is on offer. The diesel engine, on the other hand, continues to be as capable and potent as before. The only downside of the Freestyle is the lack of an automatic option at a time when every other carmaker is offering AMTs and CVTs. The Figo has started to show its age. The Freestyle, on the other hand, is not only practical but also adds more zeal to the package.